The appearance of a business plays a critical role in customers’ decision whether or not to purchase a product or enter the establishment. The appearance you present to your customers is the first impression that you make on your customers and will determine what they expect to see inside your establishment. Cleanliness not only creates tremendous buying power for the owner but also prevents slips and falls and other accidents that can lead to lawsuits and hurt the business’s reputation. Maintaining the level of cleanliness on a regular basis will reduce repair costs; pressure washing will remove grease, harmful dirt, gum, pollution, and more before the damage caused by buildup can occur. 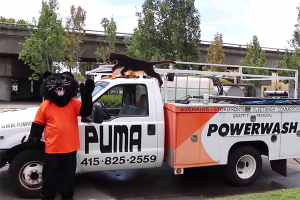 Puma Power Wash specializes in developing a routine cleaning maintenance program for commercial establishments. Our experienced, professionally certified technicians are trained to remove any dirt, grease, gum, pollution, oil, tire marks, buildup, graffiti, and more. Working together with you, we will develop a hands-on, proactive approach that will surpass your cleanliness expectations on consistent basis. Daily, weekly, bi-weekly, monthly, quarterly, yearly, we will implement and execute the cleaning program that meets your needs, time-table, and budget keeping the environment in mind. Since we are open 7 days a week, 24 hours a day, we can offer you very flexible cleaning programs. 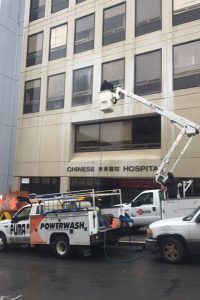 Call us today for a free estimate at 415-825-2559 and learn more about the unique cleaning process we use to maintain the commercial exterior and interior surface clean at the highest levels of cleanliness.